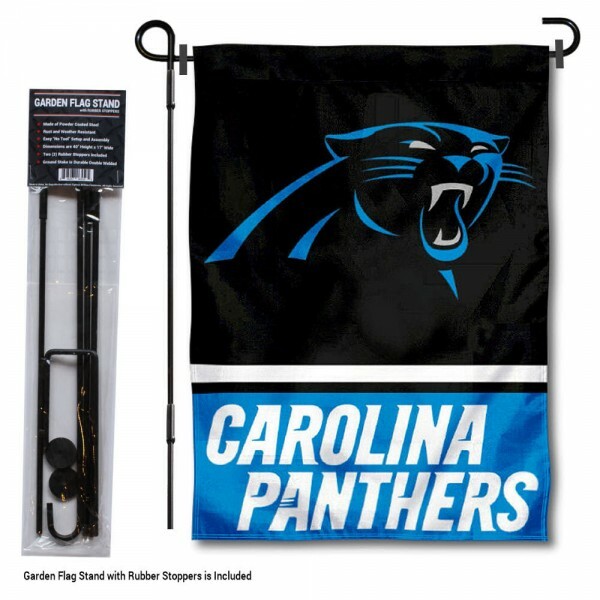 Our Carolina Panthers Garden Flag and Stand kit includes a 13"x18" officially licensed garden flag and garden flag stand with two rubber stoppers. The garden flag stand is the recommended accessory to display your garden flag anywhere in your garden, yard, flower pots, or at the front entrance to your home. This garden flag hangs vertically, measures 13"x18", and provides a top pole sleeve for insertion of the included garden flag stand. Made of 2-ply polyester with Sewn In Liner, the flag is double sided Screen Printed with the team insignias, as shown. Due to this garden flag being 2-ply material with interior liner, the team logos are double sided and Readable and Viewable Correctly on Both Sides. Hang your garden flags up to 14 inches wide with our included Garden Flag Stand. The flag stand has a total height of 40 inches, a crossbar width of 17 inches to hang your flag, and includes two (2) rubber stoppers to help keep your garden flag secure on windy days. The Garden Flag Stand with Stopper Set easily screws together so there is no need for a hammer or any tools! Also, the stand is made of steel, is powder coated black for rust resistance, and the ground stake is made with double welds for extra durability. A perfect gift, our Carolina Panthers Garden Flag and Stand kit includes the recommended flag stand hardware so it's easy to install and ready to fly proudly!